Utilizing its sharp and sleek body style and athletic looking front end, Canada’s best selling compact car is all about the flair. 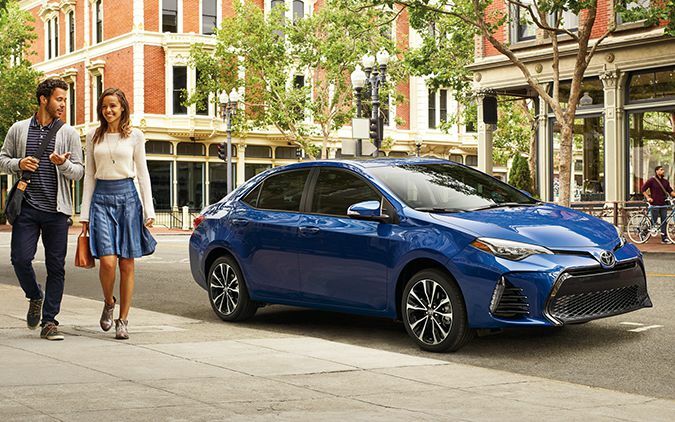 The 2019 Toyota Corolla offers six fuel-sipping models that save you at the pump, while still providing the same dependable Toyota reliability that has driven success. This five-seater sedan has a little something for everybody and features an extensive lineup; this includes the CE 6M, CE CVT, SE 6M, LE CVT, and LE ECO SVT. The 2019 Toyota Corolla is proof that good things come in small packages. It features incredible comfort with an available heated steering wheel and heated SofTex bucket seats in the front, with spacious rear legroom and 60/40 split folding rear seats in the back. Cabin colours include black or grey, with high-quality dash and shift knob materials that give the Corolla a more refined feel. An available 8-way power adjustable driver’s seat is comfortably within reach of available paddle shifters and an available push-button start. A more assertive body style is what defines the 2019 Toyota Corolla. Its sharp, sleek LED headlights and an imposing black front grille and bumper are flashy and striking. A power or sliding moonroof is available to soak up the sun; while available power adjustable, foldable, heated side mirrors provide an additional modern touch. Available in eight sophisticated exterior colours, with alloy wheels in 15, 16, and 17-inch variants and in several different styles – this Corolla is a compact sedan with an aggressive kick. 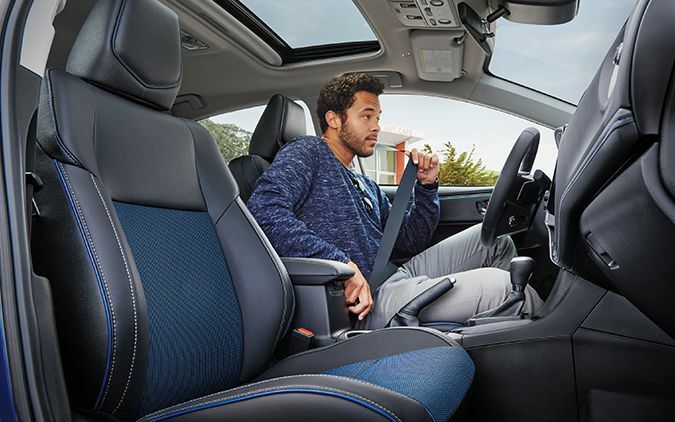 With the 2019 Toyota Corolla, you are given a 6.1-inch touchscreen provides you with modern entertainment control and a standard backup camera. 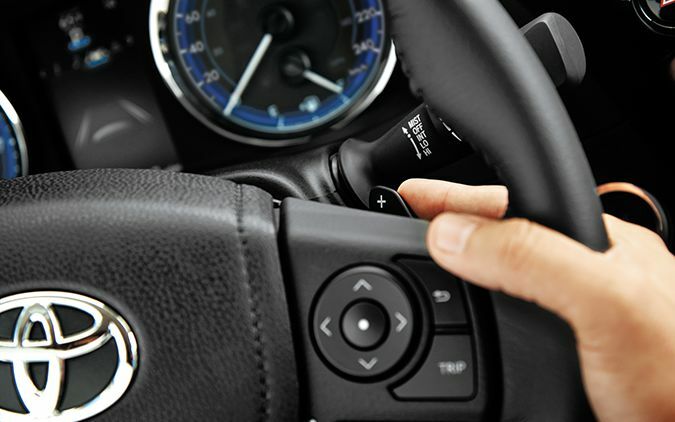 Steering wheel-mounted buttons keep the driver focused and prepared, and a USB/Aux input allows you to control your music directly from your smartphone device. Bluetooth capability sets the stage for endless hands-free phone conversations, and there is even a 7-inch touch screen display available for those looking for an amplified tech experience. Life shouldn’t always come with boundaries or a cookie-cutter template. Customize your perfect 2019 Toyota Corolla with door sill plates, roof racks, dash cameras, cargo nets, paint protecting film, and even a TRD exhaust system. With a seemingly limitless supply of genuine Toyota parts and accessories to fit your style, you’ll never be left wanting. 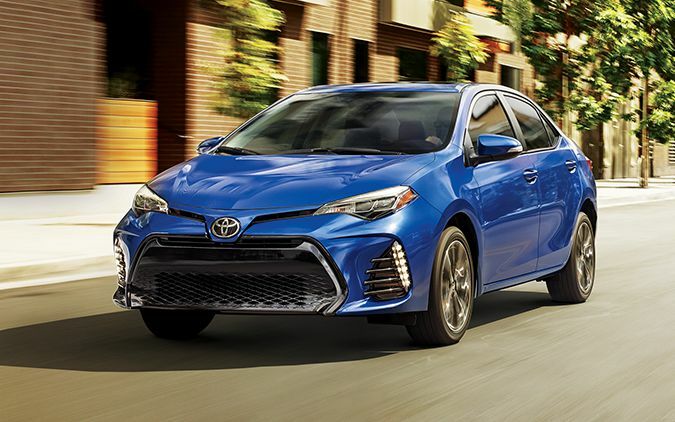 The highly efficient 2019 Toyota Corolla is lightweight and streamlined and can be equipped with an aggressive rear spoiler to further reduce drag and enhance fuel efficiency. A 6-speed manual transmission offers in-depth control, and available paddle shifters provide race-inspired style with a four-cylinder Continuously Variable Transmission that excites. Low-rolling resistance tires hug the road with confidence, and an available sport gauge cluster provides an illuminated speedometer, displaying your current song and providing fuel consumption information. Not just that, but the Toyota brand continues to impress as the Kelley Blue Book Best Resale Value brand of 2018. The 2019 Toyota Corolla comes with a fully comprehensive warranty package to protect you and your investment. So drive with confidence that we’ll always have your back. There are so many reasons to love the 2019 Toyota Corolla. This compact sedan comfortably seats up to 5 and provides exceptional bang for your buck at the pump. The inviting, spacious and sport-inspired design brings together form and function for a harmonious blend of style and efficiency. So come on down to your local Edmonton Toyota dealer – Gateway Toyota! And book a test drive in the 2019 Toyota Corolla today!